The Halo Vault: Pillars pillars pillars! 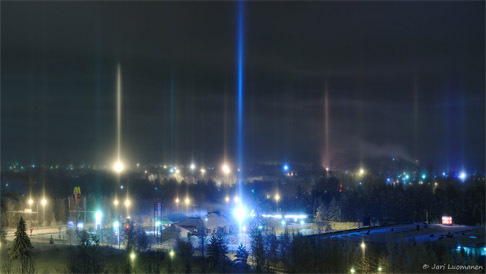 January 2010 in Tampere, Finland has seen an incredible onslaught of pillars. Starting from New Year’s Eve cold weather (which recently has been fed by Siberian high) has settled over Finland. The temperatures have been around -20 °C. Pillar forests have reigned night after night, as the conditions have been mostly favourable to crystals that only produce pillars. Snow making in the ski centres of Tampere area has stopped about two weeks ago. Despite this, diamond dust has been a nightly occurrence. Sufficient humidity and probably urban emissions have contributed to crystal precipitation. We have hunted halos practically every night, driving around Tampere to find the crystal swarms. To our surprise these swarms - usually a few kilometers across - remained in one place throughout the night. Our impression is that local topography affects this behaviour. I too have this experience that halos occur near certain places all night. There are places which are good every night, and then some sporadic surprises, which are good during one night and poor the next. You have some awesome shots in your galleries!